A Comedy of Errors | Damian Trasler's Secret Blog - Do Not Read! A different configuration for the stage this year, but still simple, and able to represent numerous locations. Last year’s Bard on the Beach was a bust for us – we were ready to go and be entertained on Sunday morning, but it turned out we had tickets for Saturday afternoon. Oops. This year we almost missed the boat completely. With visitors throughout the summer, it was always an option, but superseded by other events. Lucky for us, Middle Weasel asked about it with just days of performances left, and we ended up booking tickets for the final performance of the season. 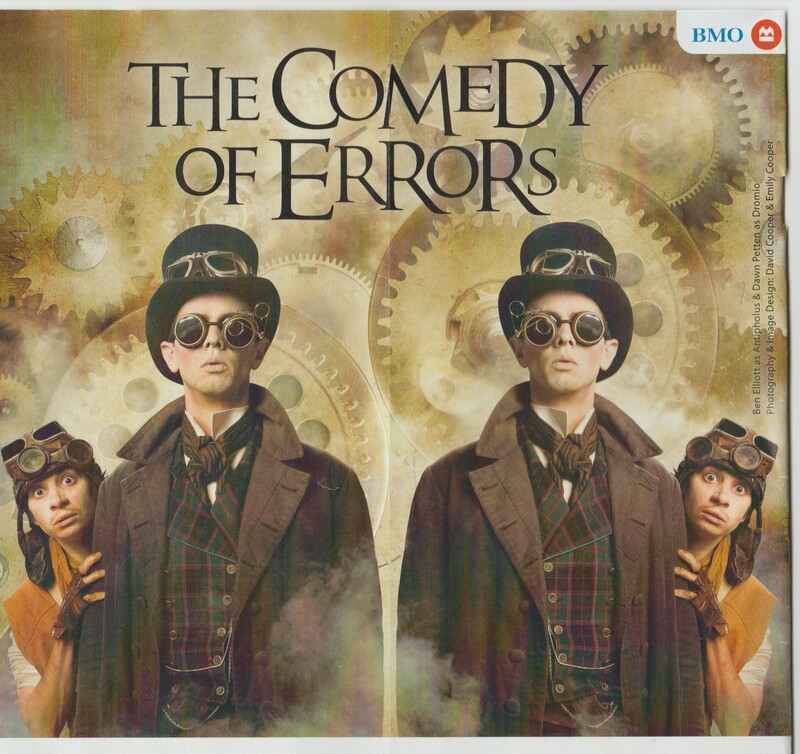 The play we booked was “A Comedy of Errors”, one that none of us had encountered before. 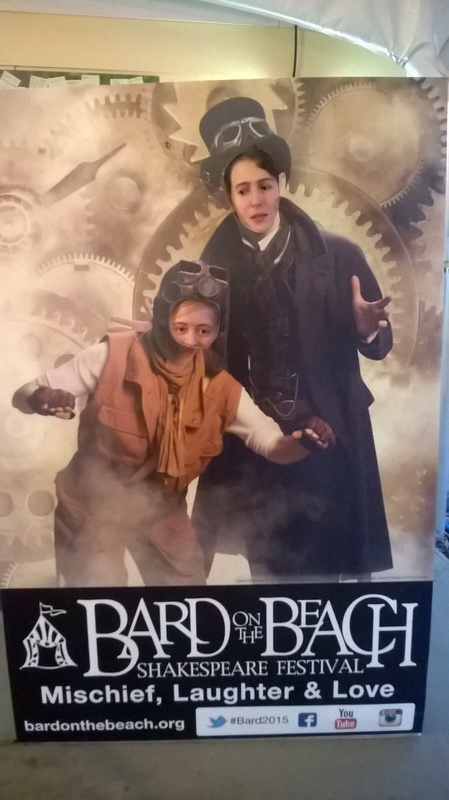 The production had transformed the setting into Steampunk, and we were all excited to see how that would work. 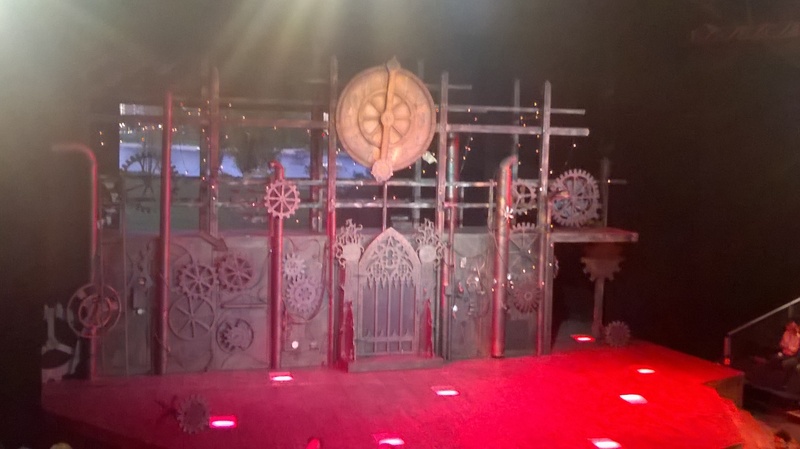 As the photo shows, the set was all brass and cogwheels, with steam and clanking, grinding sound effects from five minutes before the start of the show. The characters wore great outfits – goggles, metal-accented limbs, eyepieces, Victorian styles. The story concerns two pairs of identical twin boys, who are separated in a shipwreck, and are then amusingly mistaken for and by each other… over and over again. It’s no surprise that the performance was excellent. The production values are high, and this was the final performance of the 26th Season of Bard on the Beach – you don’t get longevity like that with mediocre work. But it felt like the last night was giving the performance some extra zing. The actors were clearly having a lot of fun with their roles, and there was more than a hint of in-jokes being played throughout. The Weasels try out a Steampunk look. As always, I was mesmerised by the fact that a simple set – in this case a walkway above and two side entrances plus a central doorway – could be so many locations. I wanted to film the proceedings and post it on the Lazy Bee website to show other playwrights what is possible with a minimal set and a wild imagination. Of course, the person I should be reminding about it is ME. 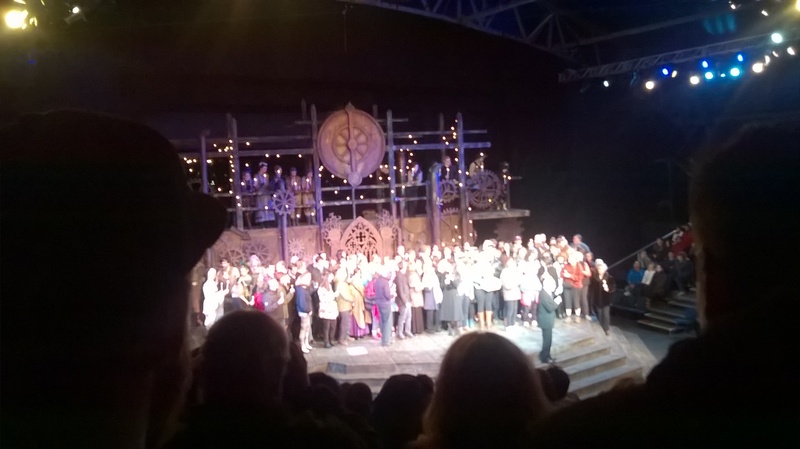 The evening closed with a brief ceremony to mark the end of the season, with the Artistic Director inviting all the cast, crew and volunteers onto the stage. Each brought a candle, and the AD recited Prospero’s closing speech from “The Tempest” – the lights went down, and the candles were blown out. We’ll be coming back next year – Romeo and Juliet is on the schedule, and Middle Weasel is studying that this year. Come along to Vanier Park and see it with us – there’s no better way to see Shakespeare!